The Rev. 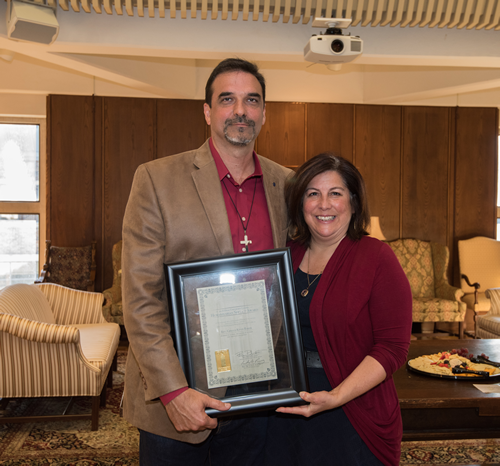 Kevin Baker received this year’s Duke University Chapel Humanitarian Service Award at a reception on campus on Sunday (Oct. 2). The award recognizes people with a commitment to service and simplicity. Rev. Baker, a graduate of the Duke Divinity School (in photo right with wife Denise), is the lead pastor at First United Methodist Church in Graham, North Carolina, and a chaplain at the Alamance County Detention Center. At First United Methodist, Baker has led his congregation in serving children at South Graham Elementary through tutoring and providing meals and clothes to those in need. He has also formed partnership with an organization supporting parents of teenagers and a community health center. The Humanitarian Service Award is inspired by the lives of two Duke professors: Dr. George R. Parkerson Jr. and the late Dr. C. Eric Lincoln. Dr. Parkerson was present at the ceremony honoring Baker. Dr. Lincoln was among the first members of the Reconciliation church founded by Baker and others. The recipient of the annual award receives a grant of between $1,500 or more to further humanitarian efforts.